Our Kitchen Worktops and Breakfast Bars come in a choice of natural effect finishes. Choose from a range of finishes that will fit with any kitchen colour scheme, and we have worktop trim and matching colourfil to maintain your breakfast bar. We have a wide range of stylish kitchen worktops to tempt all tastes. From classic to contemporary designs, add a traditional touch to your kitchen or make a modern style statement. Whatever your particular taste, Davies DIY & Builders Merchant are sure to have something to suit. ​Create the effect of a granite worktop at a fraction of the cost with our wide range of laminate products. Available in an array of stylish finishes, from natural slate to stone, laminate worktops make an attractive addition to any style of kitchen. Alternatively, choose from our vast laminate collection and make a style statement with a wood worktop. From beech to bamboo, choose from an array of stunning designs in long lasting finishes. 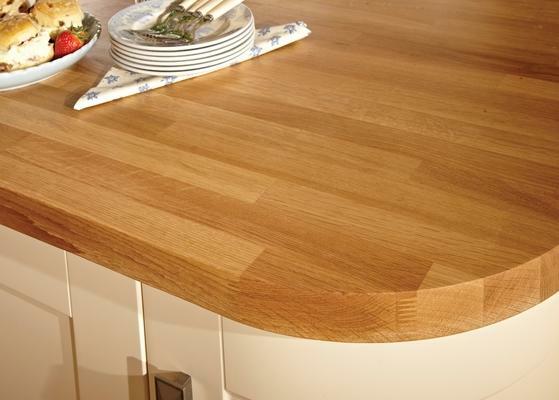 For a hardwearing product to complement any kitchen, why not consider choosing from our range of solid oak worktops? Solid wood can be cut to any shape and adds warmth and depth to any kitchen design. Browse our product pages online for splashbacks and worktop accessories to add the finishing touch to your surfaces. Co-ordinate worktops and kitchen splash backs for clean lines and increased design cohesion. Solid wood worktops add warmth and character to a kitchen. They are suitable for use with any sink and can be profiled or grooved to create intricate detailing. Splash backs & Upstands are an attractive and effective way of protecting the back of your cooker, and adding a stylish finish to your kitchen.